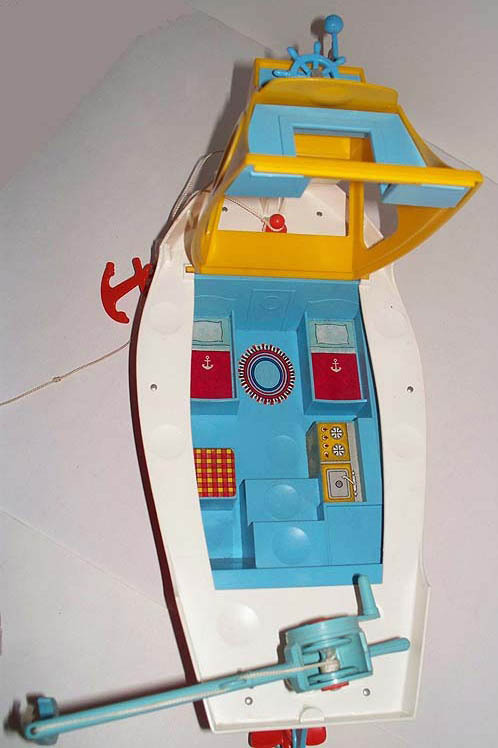 Description: The #590 S.S. Littleputt set includes the same cabin-cruiser that was sold with the #594 Marina. 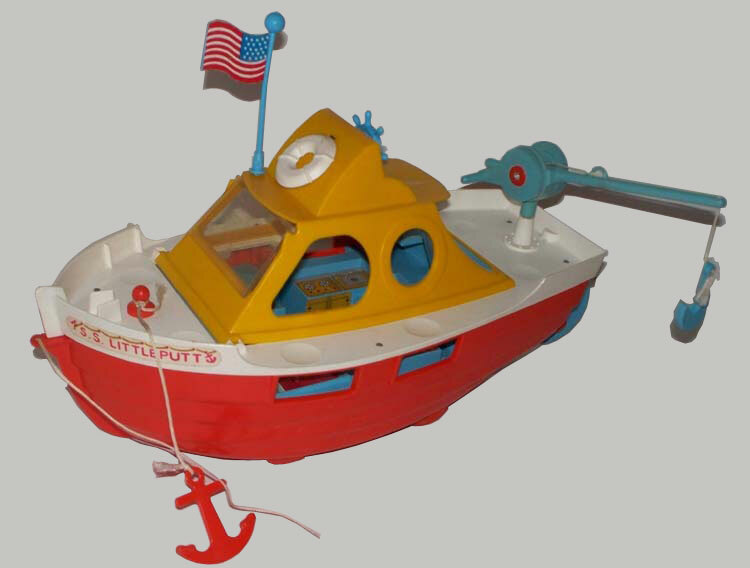 S.S. Littleputt Top - HTW165 - Yellow boat top with 5 windows on the sides, a blue "wall" with doorway on the back, and a captains deck with a blue spinnable steering wheel on the top. The front window has a rectangular clear plastic "windshild" that lifts up. Flag - HTW166 - Blue plastic flagpole with a wavy flag (has litho of an American flag on each side of the flag). 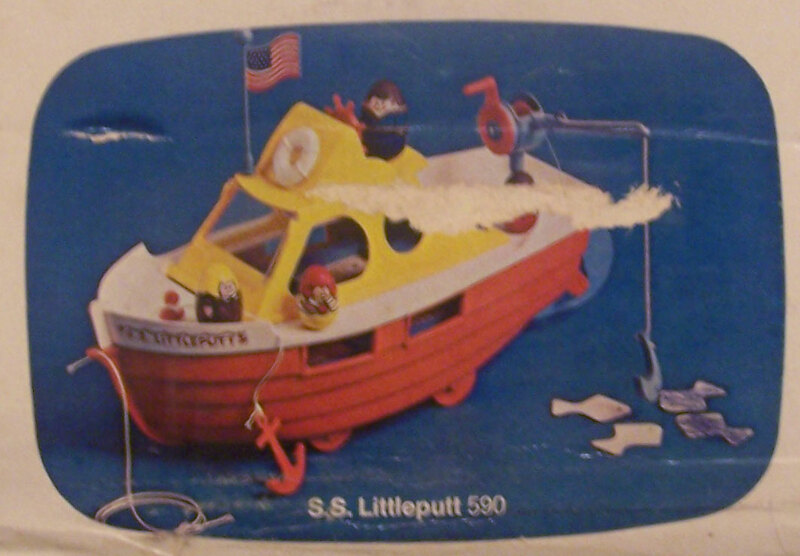 The base of the flagpole fits into a corner above the S.S. Littleputt's "windshield". Anchor - HTW167 - Flat red plastic boat anchor with a loop through the top for the attached rope (opposite end of rope has a loop to attach to a red knob on the S.S. Littleputt front deck). Fishing Pole - HTW168 - Blue fishing rod with a peg under the reel that fits into an upright fishing pole stand on the S.S. Littleputt back deck. A rope fits within the reel, and runs down to the tip of the pole. The end of the rope is attached to a blue plastic (magnetic) hook. Fish: Includes 4 flat "magnetic" fish (can be "caught" with the S.S. Littleputt fishing pole/hook). HTW1 - Dad - Blue base, brown top (hair) man with light blue shirt. The shirt cuffs and collar are red/white. HTW2 - Mom - Brown base, yellow top (hair) female with a brown shirt. The shirt has a small white collar and pink flowers. HTW3 - Girl - Yellow base, red top (hair) girl with a white shirt. The shirt has a small yellow collar and yellow sleeves. The girl is holding a large red apply. Pictured on 1974's #596 Airport Box.